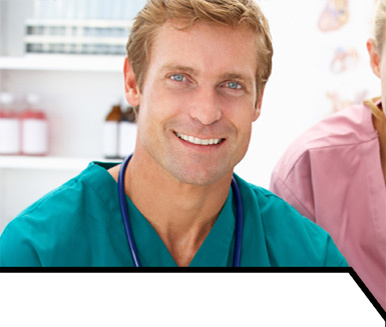 CanadaQBank is an online test preparation review service for the medical licensing exams of Canada. 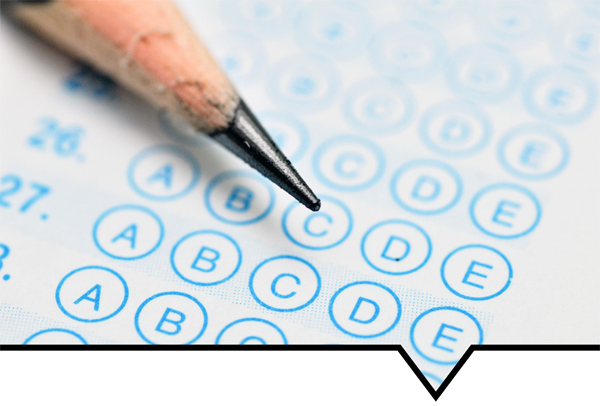 Our prep test features, accuracy and expertise in question and case creation will give you the very best studying preparation experience available to pass your Medical Council of Canada medical exam. Thousands of Canadian medical students and physicians worldwide use CanadaQBank to help them prepare for the MCCEE, the MCCQE Part 1 and the MCCQE Part 2 with our practice exams and questions. Please sign up and be on your way to passing these Canada medical exams with the highest scores possible, or check out our free Demo QBanks. The very first, and only, app available on iTunes for the MCCEE! ...with the option of accessing all 3300+ MCCEE questions from the CanadaQBank.com website directly within the app. Prepare for the Medical Council of Canada Evaluating Exam (MCCEE) with this great new app by creating personalized tests with 3300 MCCEE-style questions covering the 6 main subject areas. 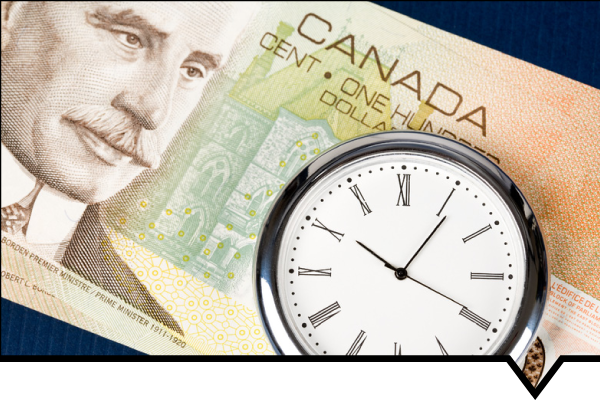 CanadaQBank offers institutional discounts for access to our online question banks. Contact us today to learn how we can help to bundle our products together for a complete and customized solution tailored specifically for your academic and/or professional needs. Significant reduction in pricing for your members and unlimited usage of our services. We can provide reports on how many of your members are using the website. We can help set up a portal for your institution. Set up is quick and easy and requires only a few days to complete the entire process for your institution. We can help set up IP and e-mail authentication at no extra charge. 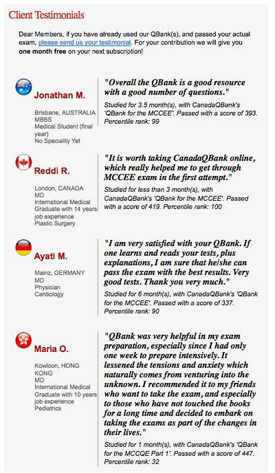 Why are so many medical students and physicians worldwide choosing CanadaQBank? CanadaQBank is very user friendly. It is completely web-based, there are no heavy books, and students access the system immediately from any computer with internet access. Our QBanks contain the very best and most specific questions and cases for the Medical Council of Canada (MCC) exams. We have built a strong reputation since launching our website in 2008, as an excellent web-based test preparation service for the MCC licensing exams. Our website offers a complete service for anyone preparing for the MCC exams with QBanks for the MCCEE, MCCQE Part 1 and MCCQE Part 2, discussion Forum, Facebook group, bi-monthly newsletters, demo Videos, FAQ Section, latest Features, Careers for question/case developers and user Testimonials. We are always improving and expanding. Out future projects include: an iPhone/iPad app, dividing each subject into Topics, Flash Cards, Online Chat for users to interact, more Videos and an all new design. Contact us for more information and how to get started with an Institutional Partnership with us! 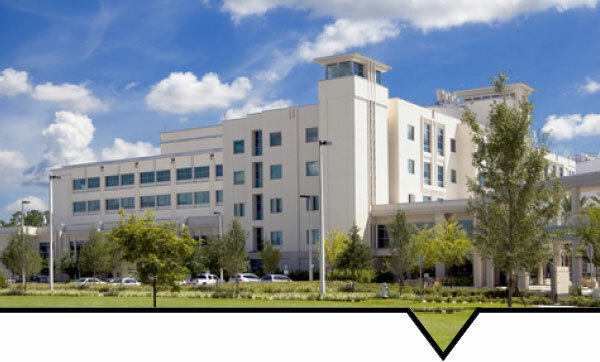 Caribbean Medical Schools have become a very popular option for undergraduates wishing to pursue a career in medicine. In Canada there are 14 English Medical schools (3 French). 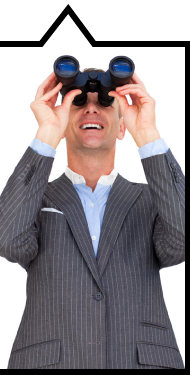 Those 14 offer 2013 spots annually. In Ontario only 1 out of every 7 applicants gets accepted and matriculates (in 2009 there were 5,815 applicants for 877 spots). 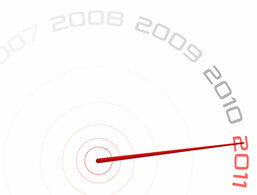 As a result, many qualified students are being rejected year after year. A typical path for Canadian students has been to apply to medical schools in the United States, but this, too, has proven to be a difficult and extremely expensive route. 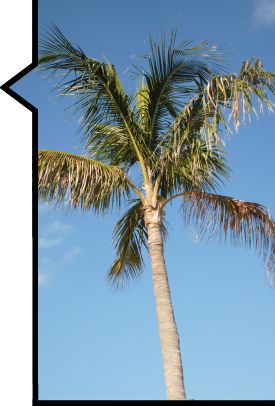 Learn more about the options Caribbean Medical Schools can offer you at CaribbeanMedicine.com. 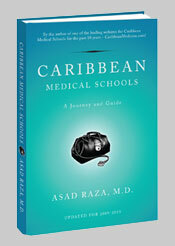 Caribbean Medical Schools - A Journey and Guide is a complete guide to Caribbean medical schools. Buy your copy today HERE! A great chart displaying the average payment per fee-for-service physician who received at least $60,000 in payment by type of practice, 2001–2002, is available HERE as a PDF. A wealth of great articles covering the Canadian doctor shortage is available to you on the internet. CanadaQBank continues to develop the very best questions and cases for the Medical Council of Canada Evaluating and Qualifying exams (the MCCEE, the MCCQE Part 1 and the MCCQE Part 2) and the United States Medical Licensing Exam (the USMLE Step 1). We are hiring motivated and talented physicians who can contribute their time and knowledge to help us develop our QBank for the USMLE Step 1. Detailed information about the USMLE Step 1 here. A 54 year old woman suffering from influenza deteriorates and develops shaking chills and a high fever. Physical examination is remarkable for dullness to percussion at the left base and decreased breath sounds on the left. Chest x-ray confirms the diagnosis of lobar pneumonia, presumed to be caused by Streptococcus pneumoniae. The patient has no known drug allergies. Which of the following antibiotics would be most appropriate to treat the patient's condition? The correct answer is D. Penicillin remains the first-line drug of choice for pneumococcal pneumonia, except in patients with penicillin allergy and in the relatively few areas in which pneumococcal strains with high-level penicillin resistance exist. Alternative therapies include erythromycin and vancomycin. The third-generation cephalosporin cefotaxime (choice A) is not usually used for pneumococcal pneumonia. Chloramphenicol (choice B) is not usually used for pneumococcal pneumonia. Erythromycin (choice C) is a good alternative therapy for pneumococcal pneumonia, but is usually used only when a penicillin allergy is present. Vancomycin (choice E) is not the first-line therapy, but it is a good alternative in patients allergic to penicillin or when high-level penicillin resistance (relatively uncommon) is present. Once you have completed the development of a case, please email it to us at: subscribe@canadaqbank.com. When we receive it, we will review the case. If it needs any editing or improvement, we will inform you. Once the case is approved, we will send payment directly to your PayPal account. Then we will add the case to our website. Free subscription for you to our QBanks for the duration that you are developing questions and cases for us. Up to 3 free online subscriptions to our QBanks (may include family members and colleagues/friends). Physicians with excellent communication and teaching skills may be considered for long-term involvement with future CanadaQBank projects, including development of our flashcards and videos in the near future. We will guide you step-by-step through the process of creating the questions and cases; but, we do need your help and expertise! Dear Members, if you have already used our QBank(s), and passed your actual exam, please send us your testimonial. For your contribution we will give you one month free on your next subscription! are trade-marks of the Medical Council of Canada (MCC). None of these trademarks are held by CanadaQBank.